After the request for support and solidarity by the Asociación de Recicladores de Bogota (the Bogota Association of Recyclers) messages of support have started to arrive from all over. We’ll be updating this post with all the the messages that arrive. You can sign the petition for an inclusive recycling in Bogotá, Colombia, read the English version first! 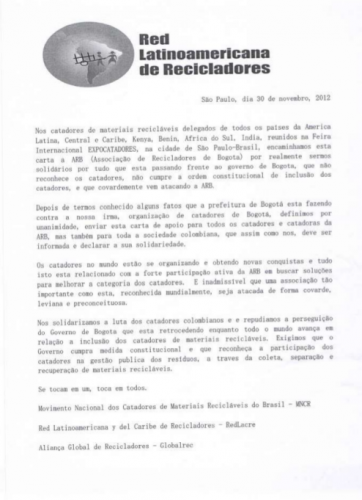 Waste pickers at the Expocatadores meeting Brazil this past Friday November 30th, representing waste picker organizations from 18 countries voted unanimously to support and recognize the struggle of their Colombian counterparts. 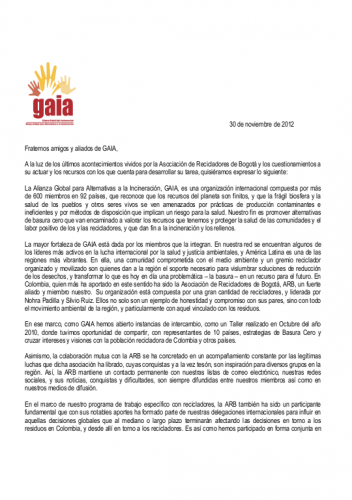 You can download the original letter (Spanish) or watch the video. En Colombia, quien más ha aportado en este sentido ha sido la Asociación de Recicladores de Bogotá, ARB, un fuerte aliado y miembro nuestro. Su organización está compuesta por una gran cantidad de recicladores, y liderada por Nohra Padilla y Silvio Ruiz. Ellos no solo son un ejemplo de honestidad y compromiso con sus pares, sino con todo el movimiento ambiental de la región, y particularmente con aquel vinculado con los residuos. Asimismo, la colaboración mutua con la ARB se ha concretado en un acompañamiento constante por las legítimas luchas que dicha asociación ha librado, cuyas conquistas y a la vez tesón, son inspiración para diversos grupos en la región. Así, la ARB mantiene un contacto permanente con nuestras listas de correo electrónico, nuestras redes sociales, y sus noticias, conquistas y dificultades, son siempre difundidas entre nuestros miembros así como en nuestros medios de difusión. En el marco de una relación donde priman la honestidad, el trabajo voluntario y la coherencia, la ARB, como parte de nuestros miembros y aliados, nos llena de orgullo y legitima la lucha por la sostenibilidad y los derechos de las y los recicladores en el mundo entero. You can download the full letter. It is with deep respect that we recognize the achievements of Asociación de Recicladores de Bogotà (ARB) in organizing and supporting waste pickers for more than 20 years. WIEGO addresses this message to you as a clear expression of our appreciation of the productive link of institutional cooperation with ARB. Women in Informal Employment: Globalizing and Organizing (WIEGO) is a global action-research-policy network that seeks to improve the status of the working poor, especially women, in the informal economy. WIEGO is made up of organizations representing informal workers, individual researchers, and development professionals working in the field of informal employment. Since our formation 15 years ago, we have worked with more than 170 affiliated members in 42 countries around the shared concern that the working poor in the informal economy, especially women, are not well understood, appreciated or supported in policy circles or by the international development community. Recognizing this situation, WIEGO has actively worked with the Asociación de Recicladores de Bogotà (ARB) to improve the living conditions of waste pickers in Bogota, in Colombia and throughout the world. 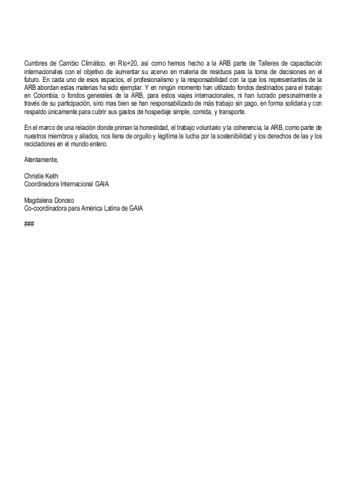 We hope that this letter will help you to understand the important role that ARB has played in the history of the organization of the waste picker sector and the way in which it has worked in the trade union movement in a professional, dedicated and responsible manner. ARB has played a fundamental role in organizing and defending the rights of waste pickers within Colombia and internationally. The association has been a pioneer in articulating the rights of workers, and played a founding role in establishing the current Latin American Waste Picker Network. At the same time, ARB has vigorously supported the movement to create a Global Alliance of Waste Pickers. Together with KKPKP, the union of waste pickers in Pune, India, ARB is the longest established, independent member-based organization in the world dedicated exclusively to waste pickers. In 2007, WIEGO co-organized, with the ARB and other national and international partners, the very successful first World Congress of Waste Pickers in Bogota, Colombia. In March 2008, member-based organizations representing waste pickers, researchers and support organizations from 34 countries met for three days in Bogota to share knowledge and discuss common issues. Having experienced first hand the excellent professional work of ARB and having established a good working relationship with ARB,performance of ARB, we have continued to work with them since then on a range of activities to organize and strengthen the waste picker sector. In 2010, we supported the organization of a Seminar on Climate Change in the city of Bogota. Organized waste pickers from more than 10 countries in the region exchanged experiences and ideas. ARB was our local partner in successfully organizing this seminar. this initiative. Recognizing the link between solid waste and the potential inclusion of the waste pickers of Bogota within an integrated model of waste management, WIEGO cooperated with ARB in developing an Analysis Tool for the Payment of Waste Removal Charges, a financial mechanism for compensation of the work of waste pickers who provide an essential public service. At the international level, ARB has always shown its commitment in helping to organize movements of waste pickers in other countries. In doing so, their only concern has been to improve the living and working conditions for this sector. WIEGO and ARB joined together in 2011 to produce a Map of Waste Pickers in Central America. Once again, ARB performed outstanding work as the secretariat for the international agenda of the Latin-American network, by coordinating the necessary steps and organization of resources in a transparent and effective manner, and by identifying representatives of waste picker organizations in 10 countries of Central America. The process culminated with the very first Central American Congress of Waste Pickers in Nicaragua in February 2012 ARB played an important role in supporting local organizations and made it possible for waste picker organizations from more than 17 countries to actively participate in the above-mentioned meeting. In addition, in order to share knowledge and describe the results of the mapping activity, with the support of WIEGO and other partners, ARB coordinated the publication of a report listing all the information collected through the Central-American process. In December 2011, Decision 275 of the Constitutional Court upheld the rights of waste pickers in Bogota. This precedent-setting legal victory has immense importance both locally, nationally, and internationally. To give full meaning to this decision, WIEGO representatives worked side-by-side with ARB throughout 2012 to ensure waste pickers were included in the waste management system of the City of Bogota by means of an Inclusive Action Plan involving waste pickers in the city`s waste removal system. We are also proud to describe the worthwhile contribution of the ARB technical support team as participants in a Research Project to Monitor the Informal Economy in 10 cities around the world. Bogota is one of the cities involved in the Informal Economy Monitoring Study (IEMS), which examines how informal workers are affected by andrespond to economic trends, urban policies and practices, the dynamics of the value chain and other social and economic forces. The Operations Manager of WIEGO conducted an audit of ARB in 2011 and found its financial system to be strong and well managed. This was corroborated through certificates and records that demonstrated the ARB`s good performance in managing the organization. We wish to publicly state that all funds identified for ARB activities were disbursed with full transparency by means of agreements for work and cooperation with specific and precise terms of reference. It is our intention to continue this productive institutional relationship between WIEGO and ARB. The success achieved in the past five years is a source of justifiable pride, and we sincerely hope that the confidence we have in ARB’s role as a progressive and dedicated leader will be fully reflected at the local, national and regional levels. The leaders of ARB have played an historic role in improving conditions for the working poor and they deserve our respect and support. Because this is my cause too! I’ve been working for recycling protecting the waste pickers for a long time! ASD-Bangladesh aspires to improve status of women in informal sector and contribute in addressing climate change effects to protect lives and nature. Los recicladores de base son los verdaderos héroes ambientales de Bogotá. Merecen inclusión en el nuevo sistema de gestión de residuos. Es importante reconocer y respetar el trabajo y la contribución de quienes se ganan la vida, al diario, sin pedir trabajo a nadie, y protegiendo el medio ambiente. Basta de robarle la fuente de trabajo a los recicladores, por la lucha y la unión siempre! La Asociación Cooperativa de Recicladores de Bogotá, es una organización coherente y consecuente en la lucha por defender el trabajo de los recicladores, la permanencia en el oficio y la dignidad. Si en este país defender la dignidad y el derecho al minimo vital es un delito????? entonces de que sociedades justas y ciudades humanas estamos hablando??????? 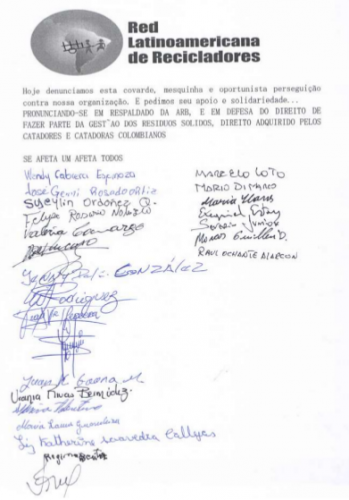 A participação dos catadores é condição para conquista do direito a trabalho decente e para alcançar a justiça social e ambiental. La formalizacion y inclusion dos papeleros y triadores de materiales reciclables es parte fundamental de una gestion integrada dos residuos solidos, de una gestion racional dos recursos naturales, y da responsabilidad social de la administracion local. Porque a luta dos catadores é uma luta digna e eles têm de ser reconhecidos pelo importante papel que sempre desempenharam em nossa sociedade. Não é juto que eles trabalhem e o lucro fique para esses exploradores inescrupulosos. Los recicladores de oficio viven de los residuos, es la oportunidad a traves de la que generan su sustento diario, no puede ser posible que queden por fuera no se puede dejar sin su trabajo. Colombia debe movilizarse para que estos grupos poblacionales mejoren su situacion economica y social a través del trabajo de reciclaje. represento como delegado a los recicladores de panamá y estoy en la lucha. Estas personas son nuestros agentes ambientales y ten derechos de participar del trabajo decentemente!!! We need to value the importance of the “recicladores” and their contribution to keep cities clean. Trabajo para los Recicladores de México. Waste pickers provide very important services that should be appreciated and supported not maligned and repressed. My work with waste pickers in Nigeria show that they endure so much marginalization and criminalization. It is important to stand up for the human rights of such vulnerable workers! The persons who have been doing this work for generations should have first right to the recyclables and to work in the new scenario because they have earned it. The move on the part of the companies to induct non waste pickers by registering different organisations is an attempt to continue accumulation and profiteering by dispossessing waste pickers. It is deplorable and against any principle of justice. More power to waste pickers struggling for their rights. Do not let the companies break your solidarity. In solidarity with your demands. Creating a Zero Waste World is a social issue first, and a market issue second. The traditional waste industry has no interest in social justice or environmental protection, but wastepickers do and are the best recyclers! Everyone should have the right to work, take care of the environment and take of their children. The Recicladores of Bogota are fighting for this right. I have worked with Colombian basuriegos in Medellin and know how hard they work and how cooperatively they work. Yet they get no benefits from the cities they serve. Their institutions need support. Recognize the Constitutional Court ruling in favor of waste pickers and the Association of Waste Pickers of Bogotá (Asociación de Recicladores de Bogotá) for its historic defense of all waste pickers. Porque los recicladores hacen una función importante para la ciudad, y su oficio supone un modo de ganarse la vida para mucha gente. Apoyo la lucha de ARB. 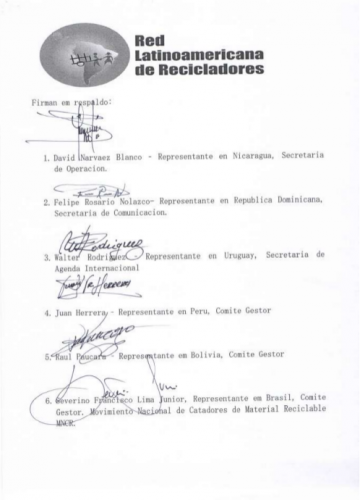 Es un ejemplo de trabajo desde la base para conseguir un sistema integrado en la gestión de los residuos en Bogotá y un mundo más justo.